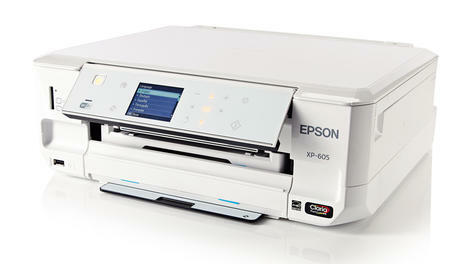 Epson’s new Expression Premium XP-605 multifunction USB and Wi-Fi printer is around 40% smaller than previous models, but not at the cost of features. For printing from mobile devices and over the internet, it’s AirPrint, Google Cloud Print and Epson Connect compatible. It has automatic Duplex and PictBridge, reads all popular memory card formats and prints directly onto CDs and DVDs. Its twin paper trays open from the front of the printer. At 100 sheets for the main A4 tray and 20 sheets for photos, they’re a little small, but this isn’t too much of a problem for home use. The trays are a little stiff, especially the output tray which has to be opened before you can print. Epson’s print quality has taken a step up, though it’s still not a match for Canon or HP. The XP-605’s photo prints are vivid and detailed, if a little dark, and it did a great job of Duplexing mixed text and images. Plain paper photo printing is serviceable, but could use deeper blacks and more vibrant light colours. Text printing is vivid, but could be better defined. You can’t fault the XP-605 for speed. It cleared our 20-page text document in two minutes and a high-quality A4 photo in two minutes, 45 seconds.